An aficionado of the Maine Beer Company, G-LO once again made a pit stop during his travels and came back with a box-o-beer. Because he was raised right, he shared his box with the various porch hangers on. I was lucky enough to get two of these beers. One such beer (and the subject of this here review) was a Pale Ale called A Tiny Beautiful Something. This beer was first brewed in January of 2014 and just happened to be a part of the eight beer rotating line-up when G-LO was there to make his purchases. 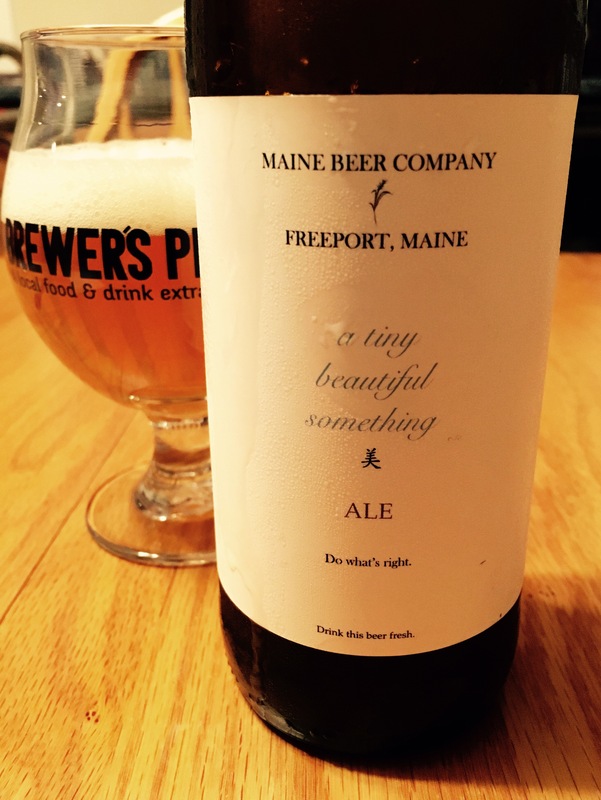 Maine Beer Company products are meant to be enjoyed fresh and I was fortunate enough to get a bottle that was dated 07/26/16. 36 days from production is pretty darn fresh to me! There was a new hop in town, and it was called El Dorado. At first blush, we thought we’d give it a tumble with some of our other favorite Northwest varieties. Then inspiration struck and we decided to brew it as a single-hop pale ale. The aroma and flavor offer intense candied orange and citrus zest. The rounded, silky mouth feel comes from the touch of flaked oats. Brewed to finish dry and clean, it’s a little bit smooth, but still a rugged individualist. Appearance: Pale orange color with a thick, slowly dissipating head of off white foam. Limpd: Malty with a nice blend of sweet citrus (oranges and apricots). G-LO: Sweet and lightly hoppy all at the same time. Honey, Nabisco Social Tea Cookies and tangerines. Limpd: Lightly carbonated. A bit doughy with a lot of hoppy bitterness. This is not a run of the mill pale ale as the hops might actually be too much with its sharp bite. There is a fair amount of hoppy aftertaste in a somewhat long and dry finish. G-LO: Smooth and creamy mouthfeel with medium carbonation. Mildly bitter at the onset. A bit of sweetness towards the middle, but then it gets bitter again. At the finish, things get very dry with some lingering piney hop bitterness. Limpd: I think G-LO enjoyed this one a lot more than I did. Having had about a half dozen different beers from the Maine Beer Company, I was a little disappointed in this one. The hops created a bit of an imbalance for me. The beer went from doughy right to the hops and then never really left the hop flavor. I didn’t really pick up the sweetness that was in the nose. That said; it wasn’t a bad beer just not as great as some of the others that I have had. G-LO: For a 5.5% ABV beer, it sure packs a hell of a lot of flavor. Not the greatest from Maine Beer Company; but still really good.